A safe playmate for your family. In short, a well-behaved dog. We do the training for you, then show you how it works. Why? It’s faster, more effective, and gets results where you need themin your home and local area. You save time and effort, and your dog is trained by a professional. Must-have dog manners: Loose-leash walking, anti-jump, polite greetings of guests and strangers, wait at the door, off-leash training, impulse control, and basic dog commands like sit, stay, and come when called. Dog behavior problems: Biting, growling, fear, shyness, separation anxiety, aggression toward dogs and people, guarding toys or food, barking and lunging on leash, fear of thunderstorms, and all other types of fear and anxiety. Advanced training: Therapy dog preparation, rescue dog training, fancy tricks like wave, roll over, put your toys away and play dead. Don’t see your problem here? Call or email. In well over a decade of doggy good manners training and behavior modification we’ve seen most things. We can help. 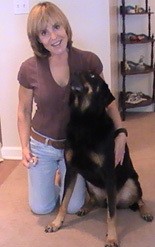 Expert, highly educated pet dog trainer with 15+ years experience. Only humane force-free training methods informed by canine behavioral science. Full-service, in-home training programs tailored to your needs. A puppy that chews on toys, not shoes. A puppy that’s polite and well-mannered. In short, a puppy you can be proud of and enjoy. You save time and effort, and your puppy is trained by a professional. House-training: Potty training, crate training, home-alone training. Must-have puppy manners: Walk nicely on leash, greet people politely, wait at the door, sit, come when called, off-leash training. Behavior problem prevention: Resource guarding prevention so you can handle your puppy’s chew bones, toys, bed, etc. Handling exercises so your puppy is relaxed and well-behaved during trips to the vet and groomer. Bite inhibition so your puppy knows how to play safely. Don’t see your problem here? Call or email. We specialize in puppy training and have seen most things puppies get up to. Let us help. Expert, highly educated pet dog trainer with 10+ years experience. Clicker training is the practice of using a sound (the click) to communicate with your dog. First we teach the dog that the click means he gets a treat. Then we mark behavior we like with a click. The idea, as with all positive reinforcement dog training, is to reward behavior we like. The clicker helps us tell the dog immediately and specifically what behavior he’s being rewarded for, which makes it easier for him to understand what we want. Clicker training is simple, precise human-canine communication that engages a dog’s cognitive abilities. Using a clicker not only helps you train your dog, it makes your dog love learning.